Gasping for air can be a terrifying experience, and if you have asthma or other respiratory conditions, you can fully appreciate this scary situation. As it can happen suddenly, would you know how to stop wheezing without inhaler assistance? Wheezing can occur with many respiratory conditions, and whether it happens with asthma or with the common cold, it may lead to a medical emergency. We define wheezing as a whistling sound during an inhale or exhale of breath. It is created when the airway passages become narrow or blocked by mucus or an object. Asthma is the most common condition linked to wheezing, but there are other causes of this event. We will look at internal and external factors that lead to wheezing and tips for how to stop wheezing naturally. Our airway passages run from the nose and mouth down to the lungs. Irritation and inflammation of these airways can cause narrowing or obstruction of air. The high-pitched whistling sound is produced by these narrowed airways. Wheezing is linked to common minor and long-term health conditions and ailments. Asthma is a respiratory condition that produces excess mucus and swelling of the airway. Pulmonary edema could block the respiratory tract as fluid builds up in the lungs. Chronic obstructive pulmonary disease, or COPD, covers an array of chronic lung diseases including emphysema and bronchitis. These diseases see the lungs inflamed causing airway blockage. Epiglottitis is inflammation of the small flap of tissue known as the epiglottis. This is located at the base of the tongue in the upper airway and prevents food from entering the windpipe, or trachea. Swallowing of an object that lodges in the airway can cause the wheezing sound. Allergies are a result of the immune system’s hypersensitivity to an environmental agent. Anaphylaxis is a severe allergic reaction that causes the airway to become inflamed to the point of blocking the air passages. Gastroesophageal reflux disease, or GERD, is a digestive disease caused by regurgitation of stomach acid or food into the esophagus. This can irritate the lining and result in narrow passages. Sleep apnea is a serious condition causing a disruption to breathing during sleep time. Heart failure occurs when the heart cannot supply the body with nutrients and oxygen as it does not pump blood efficiently. Lung cancer sees abnormal cell growth in the lungs, forming a malignant tumor that can affect breathing ability. Vocal cord dysfunction occurs with inflamed vocal cords that can narrow the airway. Medications may cause the bronchial tubes to narrow and obstruct the airway passages. Smoking—even second-hand smoke—can cause inflammation of the airway as well as extra mucus production. Bronchiolitis refers to inflamed lung airway passages, known as the bronchioles, mainly seen in children under the age of two years. Bronchiectasis is another chronic lung condition where the walls of the bronchial tubes are damaged and lose muscle and elasticity. The common cold is a respiratory ailment that produces excess mucus and persistent coughing. Respiratory syncytial virus affects the airway passages by causing lung and respiratory tract infections in children under two years of age. With wheezing being a possibly life-threatening event, it is important to know how to control wheezing without inhaler in the off chance you do not have access to one. As an asthma attack can carry on for five to 10 minutes, it is important to note the start time as anything past 15 minutes is a medical emergency. If you are sitting during a wheezing attack, stay seated. Sit if you are standing. Maintain an upright position as you attempt to catch your breath and regulate it back to normal. Tight clothing can cause or add to breathing difficulties. Loosen any clothes that may restrict your ability to breath properly. Count to five slowly as you breathe in through the nose and count backwards from five as you breathe out through the mouth. Keep your body relaxed as you focus on the breathing. It may help to perform diaphragmatic breathing by imagining you are pulling air into the stomach on an inhale and push out with the stomach muscles on the exhale. Placing one hand on the stomach with the other on the chest should help you be sure you are using the stomach muscles, allowing the chest to remain still. The above method is what helps with asthma besides an inhaler as well. Do not sit by yourself during an asthmatic or wheezing episode. If you are in a public setting alone, explain to the nearest person what is happening and ask for them to sit with you until your breathing is controlled. They also may need to help you if you need emergency medical assistance. Having someone close can also help reduce any anxiety that can exacerbate the situation. Leave the area during an attack, as a change in your environment may alleviate any stress and you’re your breathing. When at home, walk into another room or in public go to a restroom. Drink one to two cups of coffee or black tea as the body naturally converts caffeine into theophylline, an active agent of asthma medications. These warm beverages may also combat any existing excess mucus and phlegm obstructing the breathing. Acupressure may help to regulate breathing by using targeted lung pressure points to release muscle tension. Gently press on the front of the shoulder above the armpit. Repeat on other shoulder. If possible, have someone apply pressure to the inner shoulder blade one inch below the top of the shoulder blade. Inhale steam to stimulate the airway passages by sitting in the bathroom with the door closed and hot water running in the shower for 10 to 15 minutes. Use a humidifier if you have one or fill a basin or bowl with hot water and place a towel over your head as you lean over the water and inhale the steam. Yoga helps train the body and mind to perform proper deep breathing techniques that can be helpful during a wheezing or asthma attack. Continuous yoga practice can promote good airflow. Keep track of triggers with the use of a diary to list the particular cause. This will allow you to avoid consuming the food or environmental stimulant present in the condition. Have a medical allergy test done to determine the type of food allergies. It may be an ingredient or chemical within a food, and not the meal itself, that causes an asthma or wheezing attack. Know any sensitivity to food you may be experiencing, as this is a different situation than food allergies. You may be sensitive to gluten, eggs, peanuts, chocolate, citrus, or dairy protein ingredient of casein. Turning to supplements is a beneficial tip for how to stop asthma naturally. Vitamin and mineral supplements can come in the form of food, herbs, and natural pill forms. Use caution when using supplements and herbal remedies, as they can counteract any required medication you take. Vitamin C may help to lessen the impact of an asthma attack. Add 500 milligrams of vitamin C to your daily diet and consume foods such as oranges and grapefruit, cantaloupe, kiwi, berries, tomatoes, broccoli, and sweet potatoes. Trace mineral molybdenum helps to breakdown some amino acids in the body that may trigger wheezing. Those ages 0 to 13 years need 22 to 43 micrograms daily, while those 14 and above require 45 micrograms daily. Women who are breastfeeding or pregnant require 50 micrograms daily. Molybdenum is also found in leafy vegetables, lentils, beans, peas, nuts, organ meats, cheese, and milk. Trace amounts of selenium are required to combat inflammation, and should be limited to 200 micrograms each day. Take in supplement form or consume crab, poultry, liver, and wheat. Vitamin B6 boosts the immune system while fighting inflammation. Daily recommendation is 0.8 milligrams for ages one to eight years, 1.0 milligrams for ages nine to 13, and 1.3 to 1.7 milligrams for ages 14 and above. Nursing or pregnant women require 1.9 to 2.0 milligrams daily. You can eat potatoes, spinach, avocados, chicken, turkey, salmon, and bananas to get vitamin B6. Vitamin B12 may also work on asthma symptoms. Daily vitamin B12 supplements are limited to 0.9 to 1.2 milligrams for ages one to eight, 1.8 milligrams for ages nine to 13, and 2.4 milligrams for ages 14 and above. Pregnant and breastfeeding women need 2.6 to 2.8 milligrams daily. Get the vitamin in foods such as fish, seafood, meat, eggs, and cheese. Omega-3 fatty acids work as anti-inflammatory agents, and a daily diet should include 2000 milligrams of EPA and DHA. Consume herring, salmon, tuna, mackerel, anchovies, sardines, flaxseeds, walnuts, pumpkin seeds, and canola oil. Ginger could stimulate asthma medication to quickly open the airways more efficiently when combined. This helps to release muscle tension that narrows the breathing passages. Butterbur is a herb traditionally used by asthmatics of Europe and Asia with home remedies for wheezing. Its anti-inflammatory properties are thought to help to open the airway passages. This perennial plant is from the Asteraceae sunflower family. Wheezing is a common condition during asthma attacks and in other medical situations. This whistling sound is caused by the narrowing or obstruction of the airway passages from inflammation, environmental irritants, or affliction to the passages. Severe asthma attacks and other wheezing conditions may require medical attention to prevent complete loss of breath. Milder cases may be treated or prevented by using home remedies to regulate breathing and making lifestyle choices. 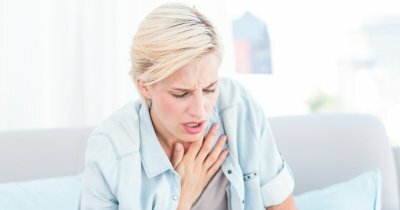 Avni, “How To Stop Wheezing,” Rapid Home Remedies, March 10, 2016; http://www.rapidhomeremedies.com/stop-wheezing.html, last accessed August 2, 2017. “Wheezing,” Mayo Clinic; http://www.mayoclinic.org/symptoms/wheezing/basics/causes/sym-20050764, last accessed August 2, 2017. “How To Stop An Asthma Attacker Without Inhaler,” Wiki How; http://www.wikihow.com/Stop-an-Asthma-Attack-Without-an-Inhaler, last accessed August 2, 2017.